It is interesting to note that despite the construction industry meeting and surpassing these two metrics, the industry is still one of the least automated. Researchers have only realized the potential and have now focused their attention on the construction industry. In 2012, way before collaborative robots had made any considerable impact, the International Association for Automation and Robotics in Construction (IAARC) published a report that detailed the value robots would bring to material handling in construction. The report put together after the 29th International Symposium of Automation and Robotics in Construction (ISARC), was full of insights from industry leaders and innovators. The report identified material handling as a particular resource consuming task in the construction industry especially considering how work in any construction site involved massive material handling tasks. The report further proposed that automation and especially robotics could enhance productivity in the material handling process while guaranteeing safety for workers. Since then the construction industry has come a long way as we have seen the advent of SAM, street laying robots, autonomous vehicles, drones and 3D printing robots. 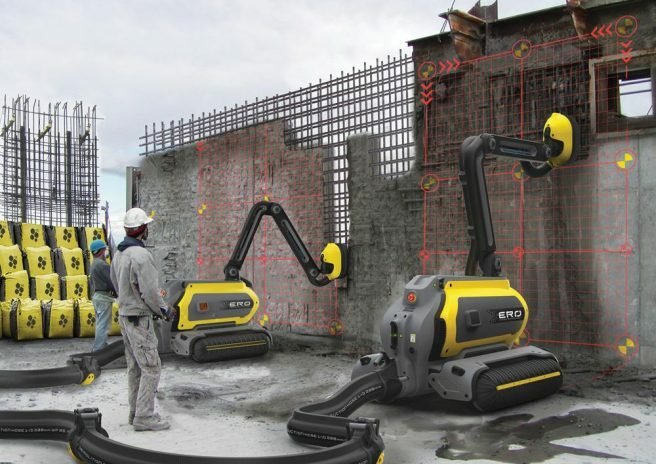 SAM100 is a robot designed for bricklaying. The robot is made up of a robotic arm and a conveyor belt and according to those who have used SAM, he can lay bricks 6 times faster than a human builder. Tiger Stone is a semi-automatic robot capable of laying bricks previously arranged into a continuous layer of the road. Drones are slowly becoming a mainstay in the construction industry. Drones are used to measure volume, area or distance in a fraction of the time it takes a human. Additionally, they gather any information pertinent to the construction quickly not to mention spotting hazards before they occur. The above applications are just a fraction of the potential of robotics in the construction industry. However, they have set the foundation upon which more automation is set to take place. Those in the construction industry agree that the industry is set for a major disruption that will see automation take hold like never before. A major selling point of collaborative robots (cobots) is that they are extremely precise and perform repetitive tasks to perfection. A UR10 of Universal Robots, for instance, is used by the LEAX Group to change bits within a shaving machine because of its precise nature. Similarly, a construction robot will bring this preciseness to a construction site leading to fewer and less costly mistakes. In turn, the construction process will be faster hence saving time and money. Second, as identified in the IAARC report, collaborative robots will guarantee a level of safety in construction sites. In the United States, in 2016, according to the Bureau of Labor Statistics, the construction industry reported the highest number of fatalities amongst all the other industries. The statistics are a good representation of what is happening all over the world because construction carries with it a ton of risk. By taking over some of the riskiest tasks, robots will help reduce fatalities in the construction industry. Universal Robots is one of the leading manufacturers of collaborative robots across the world. They have made inroads in so many industries including food agriculture, furniture and equipment, pharma and chemistry and science and research. One of their greatest assets is the belief that there is no industry in which they cannot provide an answer to. Whether an industry is in their current list or not, their collaborative robot arms can always be customized to bring value to any work environment. That is why as construction robotics continues to disrupt the industry, many are waiting to see what universal robotics will introduce to the construction industry. The only surety is that the product will add value.